If you are iron deficient, prune juice is a viable source of iron. But prune juice is a non-heme source of iron. Fruits and vegetables are non-heme iron sources. Meat and fish are heme sources of iron. According to the National Institutes of Health, your body absorbs heme sources of iron at a rate of 15 to 35 percent. Non-heme sources of iron are absorbed at a rate of 2 to 20 percent. This can impede your body's efforts to rebuild your iron supply if you are already iron deficient. Fortunately, the vitamin C in prune juice and other foods helps your body better absorb iron. An untreated iron deficiency can cause anemia, a condition in which your body does not produce enough red blood cells. If you have anemia, you may tire easily, feel light-headed or have chest pain or a racing heartbeat. It is also possible that you may not display any symptoms and be unaware of your condition until you are given a blood test by your physician. Women, teenagers, athletes and vegetarians are especially at risk of developing iron-deficient anemia. You are also at risk if you donate blood frequently or have a serious intestinal issue, such as a bleeding ulcer. The Institute of Medicine recommends that men over age 19 receive 8 mg of iron per day and women ages 19 to 50 receive 18 mg of iron daily. 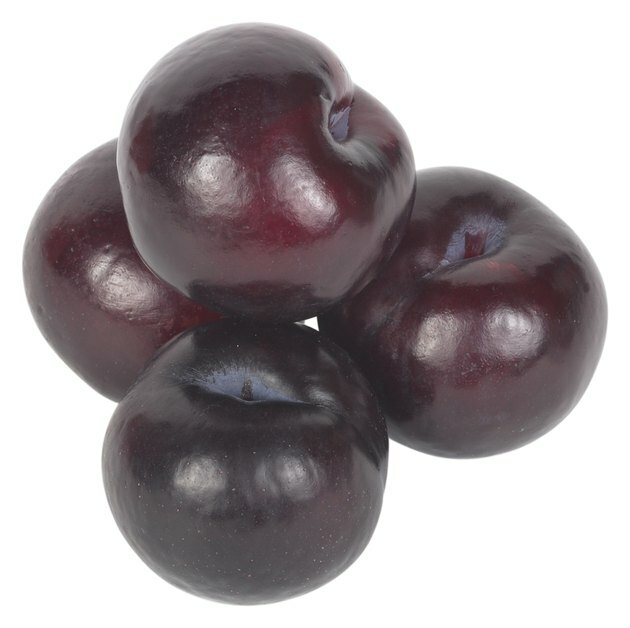 One cup of prune juice contains 3.02 mg of iron. In comparison, 3 oz. of beef contain up to 7 mg of iron, the same as a cup of diced chicken or turkey. Prune juice also has 10.5 mg of vitamin C, 31 mg of calcium, 36 mg of magnesium, 2 mg of niacin and small amounts of vitamin B-6 and beta carotene. For vegetarians, non-heme iron sources are the only option. There is a way to increase the slow absorption rate of the iron in prune juice. In the September 2003 issue of the "American Journal of Clinical Nutrition," Dr. Margarita Diaz writes that one way to increase the iron absorption of non-heme foods is to increase your consumption of food high in ascorbic acid, a form of vitamin C. Her study found that taking 25 mg of ascorbic acid with meals twice a day increased the rate of iron absorption by more than 300 percent. In the study, lime juice was used, but orange juice, grapefruit juice, red or green peppers, broccoli and cabbage also contain ascorbic acid. Reversing your iron deficiency may take several months. Continue to have your iron level monitored during that time. Do not rely solely on prune juice to reverse your deficiency. Your doctor may prescribe an iron supplement or recommend that you see a nutritionist. Prune juice can act as a natural laxative. Filtered prune juice does not have as much fiber as dried prunes, but it does contain sorbitol, a sugar alcohol that can cause stomach cramps or diarrhea. Lower your intake of prune juice if you start to have symptoms. Due to the risk of toxicity, do not consume more than 45 mg of iron per day unless directed to do so by your physician.